A 20 percent chance of snow showers. Partly cloudy, with a low around 22. Breezy, with a west wind 20 to 25 mph, with gusts as high as 35 mph. A 50 percent chance of snow showers, mainly after 7am. Some thunder is also possible. Mostly cloudy, with a high near 35. Breezy, with a west wind 15 to 20 mph increasing to 20 to 25 mph in the afternoon. 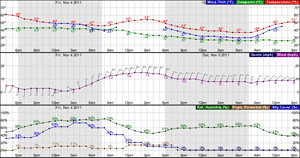 Winds could gust as high as 40 mph. New snow accumulation of 2 to 4 inches possible. A 40 percent chance of snow showers, mainly after 4am. Some thunder is also possible. Partly cloudy, with a low around 23. Breezy, with a west wind 15 to 20 mph decreasing to 10 to 15 mph after midnight. Winds could gust as high as 30 mph. Snow showers likely, mainly after 3pm. Some thunder is also possible. Increasing clouds, with a high near 25. South southeast wind around 10 mph. Chance of precipitation is 70%. New snow accumulation of 2 to 4 inches possible. Snow showers likely, mainly before midnight. Some thunder is also possible. Cloudy, with a low around 17. Southeast wind 5 to 10 mph. Chance of precipitation is 70%. New snow accumulation of 1 to 3 inches possible. Snow showers likely, mainly after noon. Some thunder is also possible. Mostly cloudy, with a high near 28. Southeast wind 5 to 10 mph becoming northwest in the morning. Chance of precipitation is 60%. New snow accumulation of 1 to 3 inches possible. A 50 percent chance of snow showers before 3am. Some thunder is also possible. Mostly cloudy, with a low around 22. North wind 5 to 10 mph becoming west southwest in the evening. A 20 percent chance of snow showers after noon. Mostly sunny, with a high near 36. Northwest wind 10 to 15 mph. A 30 percent chance of snow showers before midnight. Some thunder is also possible. Partly cloudy, with a low around 26. Northwest wind 10 to 15 mph. A 30 percent chance of snow showers, mainly after noon. Some thunder is also possible. Mostly sunny, with a high near 37. West wind 10 to 15 mph. Partly cloudy, with a low around 27. West southwest wind 10 to 15 mph. A chance of snow showers. Mostly sunny, with a high near 39. Breezy, with a west wind 15 to 20 mph. A chance of snow showers. Partly cloudy, with a low around 28. Breezy, with a west wind 15 to 20 mph. A chance of snow showers. Mostly sunny, with a high near 39. Breezy, with a west wind around 20 mph, with gusts as high as 30 mph.